The Facility for Light Scattering provides instruments for users to study the structure and dynamics of materials. Current research encompasses a broad range of materials as well as inquiry in basic science and applications, for instance from the gelation of extracellular polymeric substances in seawater to the dispersion quality of carbon nanotubes and metallic nanowires for inclusion in electronic devices. Services at the FLS include dynamic and static light scattering as well as electrophoretic mobility measurements. Static and dynamic light scattering provide non-invasive techniques for characterizing suspended materials on the nano- and meso-scale. Dynamic light scattering (DLS) primarily measures diffusive relaxation times in suspension, and therefore aids in the measurement of particle sizes, size distributions, aggregation extent, and the nature of gelation processes. Additionally, DLS is well-suited for characterizing growth kinetics and aggregation dynamics from the nm to the micron scale, in addition to sedimentation and creaming in suspensions or emulsions. Static light scattering (SLS), also called multi-angle light scattering (MALS), provides a wide variety of information regarding the structure and morphology of colloidal aggregates, as well as molecular weights and intermolecular interaction potentials for polymers, proteins, and other solutes. 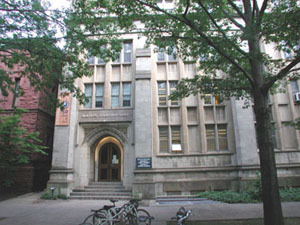 The light scattering instruments are located in Mason Lab, at 9 Hillhouse Avenue, and Dunham Lab, at 10 Hillhouse Avenue, within the Yale School of Engineering & Applied Science. On this page you can find more information about the available instruments, their measurement capabilities, the Facility’s services and fee schedule, and feedback with excerpts from user testimonials.